Is it 'The one that must not be mentioned'!!!!! The one way to avoid the thread being ruined by that is not to engage. I don’t think you can complain about receiving his opinion if you post inviting his opinion. Savage on the radio reckons Brighton and Huddersfield are safe but we are not ? Whilst they both have one more point than us their fixtures look far tougher. A bit like Candyman, say his name five times and he will appear. 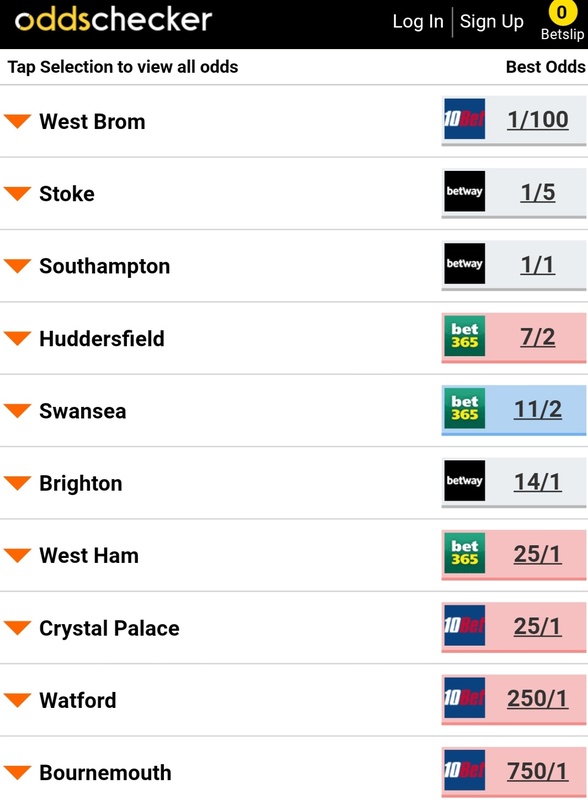 I have a feeling he wont appear for a while,the only prediction he may have got right otday was Huddersfield...... Even monkey gets 1 in 5 right!!! Southampton fixtures may not look overly difficult but away at Leicester this week 3 days before the cup semi final at Wembley. Not easy. Then south coast Derby, Everton away and Swansea away 3 days later. Finishing with City at home. Also worth nothing that if Stoke and Swansea are both below us going into the last game they play each other so only one could go above us, especially given stokes goal difference. Swansea next 3 are City Away, Chelsea home and Bournemouth away. Tough. Leicester are “on the beach” I'm afraid, and there for the taking. Now who are our next home opponents......? That loss today may send Southampton down - that’s was a massive loss. We are not safe yet but our win today was huge in the scheme of things. Do the business at Watford next week and i would say we are one point away from staying up. I find it difficult to see us going down after today's results. Had H'field not won I would have been even more confident. Obviously Stoke and Saints have it all to do, however there is always that feeling that 'they have too much quality in their squad to go down'. We all know that isn't true but they each have the players to get enough points from the games they have left to get to around 37. As far as we're concerned though, I just can't see us not overtaking Brighton or H'field let alone being caught by the teams below. It's true today was massive but complacency could kill us. Next week is huge, as is Leicester. Win those and we'd have done enough. My concern, as stated elsewhere, is that the Southampton and stoke squads are decent. They could get results but are running out of time. The Chelsea defeat yesterday will be a bitter blow for saints.